For December and January, we’ve put together a group show featuring nine local artists. Each piece that’s included has something to do with winter in Peacham. 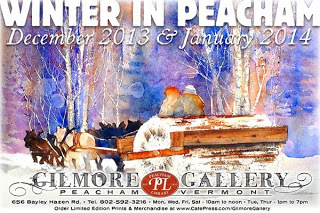 Obviously, we feel that Peacham is a uniquely beautiful place in winter, certainly worthy of an exhibit like this; and we’ve received enthusiastic response from the local arts community. Media include photography, pencil, collage, pastel, oils, watercolors and acrylics – so there’s something to appeal to just about everyone. Be sure to come in and check it out, and mark your calendar for the reception on January 12th from 4 to 6PM at the Gilmore Gallery in the Peacham Library.